The Sell! Sell! Blog: Have You Got An Attitude Problem? 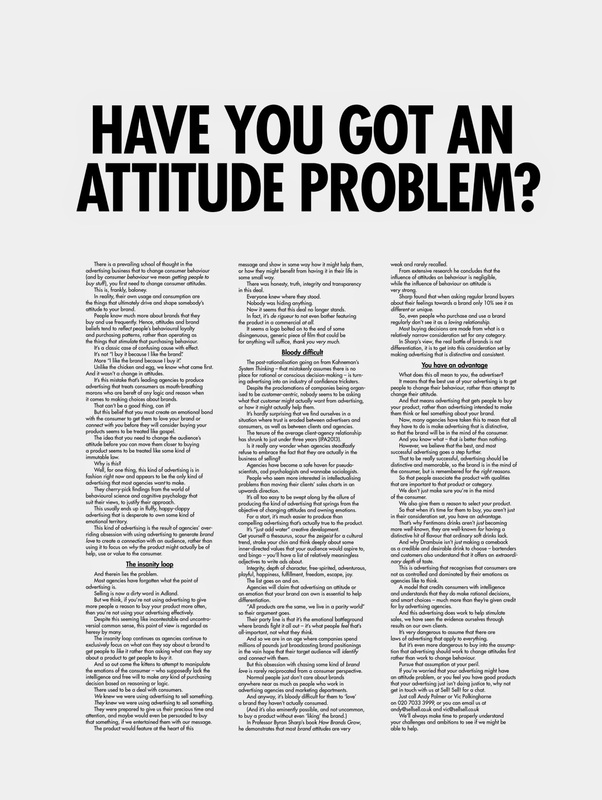 Have You Got An Attitude Problem? There is a prevailing school of thought in the advertising business that to change consumer behaviour (and by consumer behaviour we mean getting people to buy stuff), you first need to change consumer attitudes. the things that ultimately drive and shape somebody’s attitude to your brand. People know much more about brands that they buy and use frequently. the things that stimulate that purchasing behaviour. More “I like the brand because I buy it”. Unlike the chicken and egg, we know what came first. And it wasn’t a change in attitudes. It’s this mistake that’s leading agencies to produce advertising that treats consumers as mouth-breathing morons who are bereft of any logic and reason when it comes to making choices about brands. connect with you before they will consider buying your products seems to be treated like gospel. The idea that you need to change the audience’s attitude before you can move them closer to buying a product seems to be treated like some kind of immutable law. Well, for one thing, this kind of advertising is in fashion right now and appears to be the only kind of advertising that most agencies want to make. They cherry-pick findings from the world of behavioural science and cognitive psychology that suit their views, to justify their approach. This usually ends up in fluffy, happy-clappy advertising that is desperate to own some kind of emotional territory. This kind of advertising is the result of agencies’ over-riding obsession with using advertising to generate brand love to create a connection with an audience, rather than using it to focus on why the product might actually be of help, use or value to the consumer. But we think, if you’re not using advertising to give more people a reason to buy your product more often, then you’re not using your advertising effectively. And so out come the kittens to attempt to manipulate the emotions of the consumer – who supposedly lack the intelligence and free will to make any kind of purchasing decision based on reasoning or logic. They were prepared to give us their precious time and attention, and maybe would even be persuaded to buy that something, if we entertained them with our message. or how they might benefit from having it in their life in some small way. Everyone knew where they stood. Now it seems that this deal no longer stands. In fact, it’s de rigueur to not even bother featuring the product in a commercial at all. disingenuous, generic piece of film that could be for anything will suffice, thank you very much. The post-rationalisation going on from Kahneman’s System Thinking – that mistakenly assumes there is no place for rational or conscious decision-making – is turning advertising into an industry of confidence tricksters. Despite the proclamations of companies being organised to be customer-centric, nobody seems to be asking what that customer might actually want from advertising, or how it might actually help them. It’s hardly surprising that we find ourselves in a situation where trust is eroded between advertisers and consumers, as well as between clients and agencies. The tenure of the average client-agency relationship has shrunk to just under three years (IPA2013). Is it really any wonder when agencies steadfastly refuse to embrace the fact that they are actually in the business of selling? Agencies have become a safe haven for pseudo-scientists, cod psychologists and wannabe sociologists. problems than moving their clients’ sales charts in an upwards direction. It’s all too easy to be swept along by the allure of producing the kind of advertising that springs from the objective of changing attitudes and owning emotions. For a start, it’s much easier to produce than compelling advertising that’s actually true to the product. It’s “just add water” creative development. Get yourself a thesaurus, scour the zeigeist for a cultural trend, stroke your chin and think deeply about some inner-directed values that your audience would aspire to, and bingo – you’ll have a list of relatively meaningless adjectives to write ads about. Integrity, depth of character, free-spirited, adventurous, playful, happiness, fulfillment, freedom, escape, joy. The list goes on and on. Agencies will claim that advertising an attitude or an emotion that your brand can own is essential to help differentiation. “All products are the same, we live in a parity world” so their argument goes. Their party line is that it’s the emotional battleground where brands fight it all out – it’s what people feel that’s all-important, not what they think. And so we are in an age where companies spend millions of pounds just broadcasting brand positionings in the vain hope that their target audience will identify and connect with them. But this obsession with chasing some kind of brand love is rarely reciprocated from a consumer perspective. Normal people just don’t care about brands anywhere near as much as people who work in advertising agencies and marketing departments. a brand they haven’t actually consumed. Sharp found that when asking regular brand buyers about their feelings towards a brand only 10% see it as different or unique. So, even people who purchase and use a brand regularly don’t see it as a loving relationship. Most buying decisions are made from what is a relatively narrow consideration set for any category. In Sharp’s view, the real battle of brands is not differentiation, it is to get into this consideration set by making advertising that is distinctive and consistent. What does this all mean to you, the advertiser? It means that the best use of your advertising is to get people to change their behaviour, rather than attempt to change their attitude. And that means advertising that gets people to buy your product, rather than advertising intended to make them think or feel something about your brand. so that the brand will be in the mind of the consumer. And you know what – that is better than nothing. successful advertising goes a step further. That to be really successful, advertising should be distinctive and memorable, so the brand is in the mind of the consumer, but is remembered for the right reasons. So that people associate the product with qualities that are important to that product or category. We also give them a reason to select your product. So that when it’s time for them to buy, you aren’t just in their consideration set, you have an advantage. distinctive hit of flavour that ordinary soft drinks lack. as a credible and desirable drink to choose – bartenders and customers also understand that it offers an extraordinary depth of taste. This is advertising that recognises that consumers are not as controlled and dominated by their emotions as agencies like to think. and smart choices – much more than they’re given credit for by advertising agencies. And this advertising does work to help stimulate sales, we have seen the evidence ourselves through results on our own clients. laws of advertising that apply to everything. But it’s even more dangerous to buy into the assumption that advertising should work to change attitudes first rather than work to change behaviour. If you’re worried that your advertising might have an attitude problem, or you feel you have good products that your advertising just isn’t doing justice to, why not get in touch with us at Sell! Sell! for a chat. We’ll always make time to properly understand your challenges and ambitions to see if we might be able to help. I read this post a few weeks back with skepticism. Yesterday, I finished the chapter on positioning in Drayton Bird's book and now the post - and your ethos - makes perfect sense. Keep up the good work. But finding a point of difference, some truth in the product is hard work. Exactly George. This leads many people to conclude that there is no point of difference or truth to be found, just because it's hard to unearth. It's an easier route to just do some brand advertising or something that's only aim is to be remembered. Please condense this into a vaccine for brand-babble that can be administered by the tip of a dart. I have a straw. And I'm a good shot.